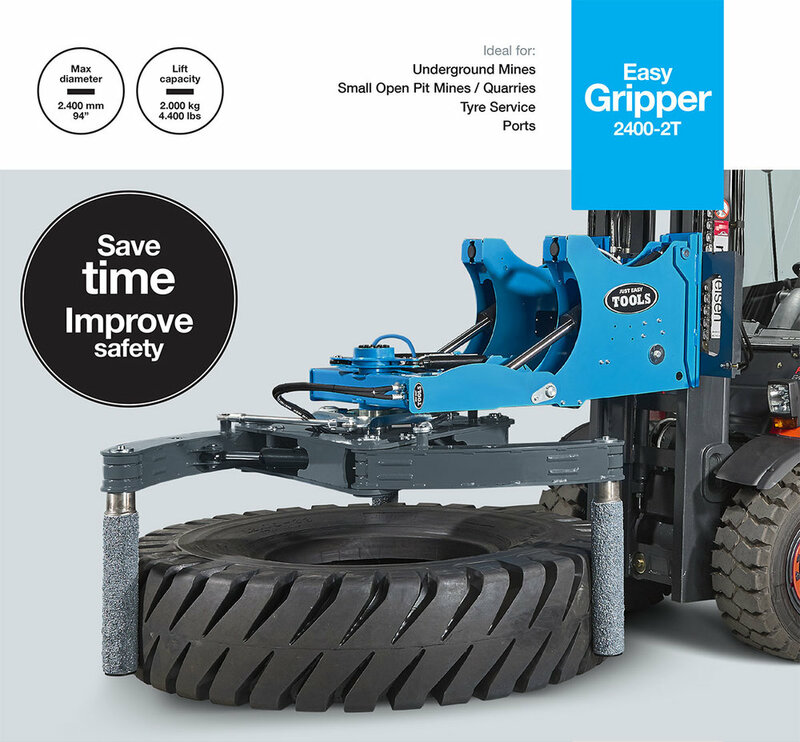 Quarries and other small open pit mines with equipment using tyres up to 35” can make good use of the Easy Gripper 2400-2T. If you want to mount the Gripper on a forklift, you can use the Easy Gripper 2400-2T with the tilt module. If you want to mount the Gripper on a front loader or telehandler, with sufficient tilt function, then the best choice is the Compact version, where you save the tilt function in the Gripper, improve the center of gravity and get a much more handy solution. In UNDERGROUND MINES all the equipment is very compact. This means that the space around the tyres and fenders is very narrow, and traditional tyre hands cannot get a firm grip of the tyres. With the Easy Gripper this issue is solved. With the unique 3-point grip the 2 bottom arms hold the tyre below the fender, and the top arm can easily be changed to a flat arm, which can get in anywhere. The Easy Gripper 2400-2T is the ideal tool and size for many of the underground mines. For open pit mines using loaders and dump trucks with tyres up to 33.00R51 and 27.00R49, we have just developed the new Easy Gripper 3100-4T. It is specially designed to perform all tyre service operations of 27.00R49, including handling of inside duals with a longer reach and a bigger center of gravity. The 33.00R51 can be handled as single tyre. The Easy Gripper 3100-4T can also be delivered in the Compact version for use on loaders or telehandlers.